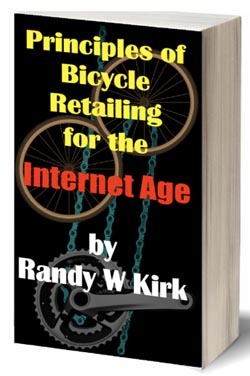 "The launch of 'Principles of Bicycle Retailing for the Internet Age,' has been a huge success," states author Randy Kirk. "None of the previous editions has had this kind of sales in the first month. The most recent version, "Principles of BIcycle Retailing III" ended up with sales of about 3000 units when there was about 6000 dealers. If first month sales are any indication, we could easily eclipses those numbers in the first few months." What is it about the new book that is creating such a buying frenzy? Most dealers at the Interbike show seemed to be very intrigued by the 100 pages (out of a 300 page book) that dealt with internet marketing. Kirk points out, "Every small business owner is feeling overwhelmed with the potential for using their website, blogs, YouTube, social media, and email blasts to reach new and existing customers. Bike shops are no different. They are trying to figure out where to spend time and money and how to use both wisely"
Other dealers seemed to like the idea that the 47 chapters in the book are only the beginning. The online portal at BikeShopOwners.com seemed be a deciding factor for many. "We have already arranged with the largest single shop bike retailer in the US to do an interview for the portal. We will have dozens of interviews with top leadership in the industry, and we won't be afraid to ask the questions that other media might not ask," said Kirk.